Ever read a Batman comic and wondered just what you would have done differently if you were the caped crusader? Sure, you have the benefit of hindsight since you know how the story pans out, but pretend for a while that you are in Bruce Wayne’s shoes – would you do what he has done? 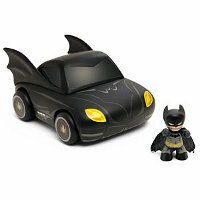 If you feel that you would have taken a different route, then might I interest you in the $19.99 Mini Mez-Itz Batmobile with Batman that allows you to relive those crucial moments in the comics, but with your own style? The Mini Mez-Itz Batmobile with Batman set is miniature goodness at its very best – Batman here measures a mere 2″ in height, but you can definitely let your imagination run wild. Boasting a real cloth cape, the mini Batmobile comes with a removable hard top, letting Batman (and his sidekick of choice) jump out and save the day. Even the dash is highly detailed, sporting a wide range of buttons and switches, and obviously for privacy’s sake, the windows will be tinted (partly because they are made out of solid plastic). This is the perfect desk set for Batman fans to have their imagination run wild. Just be more liberal with your thoughts, since the Batmobile has wheels that will not roll.